Cherry Blossom Tour – Washington, D.C.
Home » Trips » Cherry Blossom Tour – Washington, D.C.
We are heading to our nation’s Capital, Washington, D.C. for cherry blossom sightseeing. 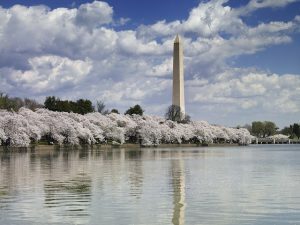 The 4 hour guided tour will begin at the Tidal Basin, from where you will have a stunning view of the Cherry Blossom along the shore. We will make stops at sights such as the Lincoln Memorial, Vietnam Memorial, Korean Memorial, War World II Memorial and FDR Memorial as time allows. Price includes transportation & tour. 1:15 PM Arrive in Washington, D.C. Pick up your guide for a four-hour tour. 5:30 PM Depart from Washington, D.C.